Durable and comfortable, World Famous camouflage cotton long sleeve promises years of service in the field featuring Ghost Camo™ patterns and a full button down front with chest pockets. Prairie Ghost™ is the ultimate Western camouflage. It is designed for areas with low growing vegetation and direct sunlight. Prairie Ghost™ features muted natural colors, predominantly vertical lines, and distinctive prairie coloration. It is the ideal pattern for grassland, sage and desert hunts. Arguably the most versatile pattern in the camo industry, River Ghost™ disguises the human outline in many terrain types. However, River Ghost is especially effective where mainstream patterns fail - treestand-hunting in small-diameter trees and in trees with no leaves. That&apos;s right, now you can blend into the background when there isn&apos;t any! That includes light-barked trees such as aspen, beech, basswood and even birch. And it also includes willows and cottonwoods. " I mix Ghost patterns to match the conditions I am huntin in," says noted outdoor writer Jeff Murray. "But if I had to rely on only one pattern, it would be River Ghost™. It&apos;s without peer"
Pull the vanishing game in conifer forests with Ridge Ghost™. Where underbrush is limited and sunlight varies from extremely bright areas to areas of shade and dark shadows, you need a completely different combination. Here, standing trees are often punctuated with deadfalls and new growth with vivid colors. Ridge Ghost™ revolves around a linear pattern with soft browns and greens against an open natural background. Ridge Ghost™ is equally at home on a mountain elk hunt or a pine plantation deer hunt. Winter completely changes the landscape in much of the country. After a great deal of experimentation, we discovered that Snow Ghost™ works best with key aspects of our highly successful prairie pattern. (Recall that monocular vision makes it a lot tougher to distinguish vertical lines than horizontal lines.) So we use muted natural colors on a "snow" background along with subtle vertical patterns. Deer and oaks go together like mice and cheese. With Northwoods Ghost™ we take our philosophy of using plenty of distinguished vertical lines - with browns and tans - so deer cannot see past the gray background. Northwoods Ghost&apos;s™ erratic black lines, which outline the tans, allow deer to focus there, not on you. If you ever hunt in hardwood forests, where the trees are dark and the ground is littered with leaves, Northwoods Ghost™ is for you. 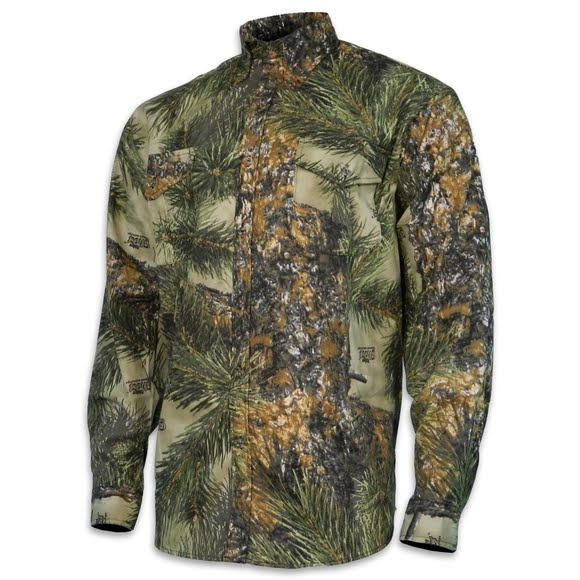 A great universal camouflage for both fields and woods, ideal for firearm or archery hunting. Ok you may not like my review because it is honest. I ordered my large shirt and when i received it . My god it was for a very small short armed man or kid or Chinese men. It you are going to sell clothing from China you should inform the people on FB that the sizes run small. Seriously I would have ordered a bigger shirt.